No. Commoning is a vocational commitment, requiring people to make a substantial commitment of their own time and money. Most commoning activity is unseen, whether that is the annual rituals of TB testing of cattle, regular checking of grazing stock, hay making for winter fodder, worming, castrating young colts, or halter-breaking each year’s foals. The most visible activities are the summer shows, when commoners compete on the quality of their animals, the colt assessments in the Spring, and the Autumn round-ups (known as drifts). All of this, of course, costs money as well as time. Veterinary bills can come randomly and be substantial but essential. The biggest cost of commoning is probably obtaining and maintaining back-up grazing. The New Forest is the country’s most expensive National Park, where grazing land has reached £60,000 an acre. Commoners use a mix of renting, borrowing, and ownership for their essential back-up land. If they have too little for haymaking then they will probably also need to buy in hay or silage for winter fodder, and for other times when their animals are not turned out to graze the New Forest. There is also, of course, a substantial investment in buying and maintaining equipment, whether stock trailers and 4x4s, or tractors and land-management machinery. Without this then the costs of hiring a contractor can mount very quickly. Checking stock is best done from horseback, and these are essential for the drifts. The costs of horsekeeping, to support commoning activities, can be substantial. Whilst those who get glimpses of commoners riding out checking stock on a sunny day may see this as a “hobby”, it certainly does not feel that way at the end of a winter working day or when things go wrong- the need to catch and bring home a sick or injured animal will always come about at the least convenient time. 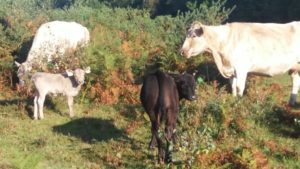 A huge effort has gone into improving the quality of the animals that graze the New Forest, but a substantial effort is needed if they are to achieve a respectable price when sold. The effort of halter-breaking a pony foal might, for example, add £50 to its value, but will add much more for a commoner’s pride at the saleyard. The Commoning Census, repeated each decade, reveals the motivations of commoners: Pride in the New Forest, a desire to be part of the “real” New Forest, and a commitment to sustaining this ancient practice. The Basic Payment Scheme (BPS) has certainly helped reduce the costs involved in a commitment to commoning, and has done much to achieve the boost to cattle numbers demanded by Natural England. As a Europe-wide scheme the BPS does not, however, require any commitment to commoning. 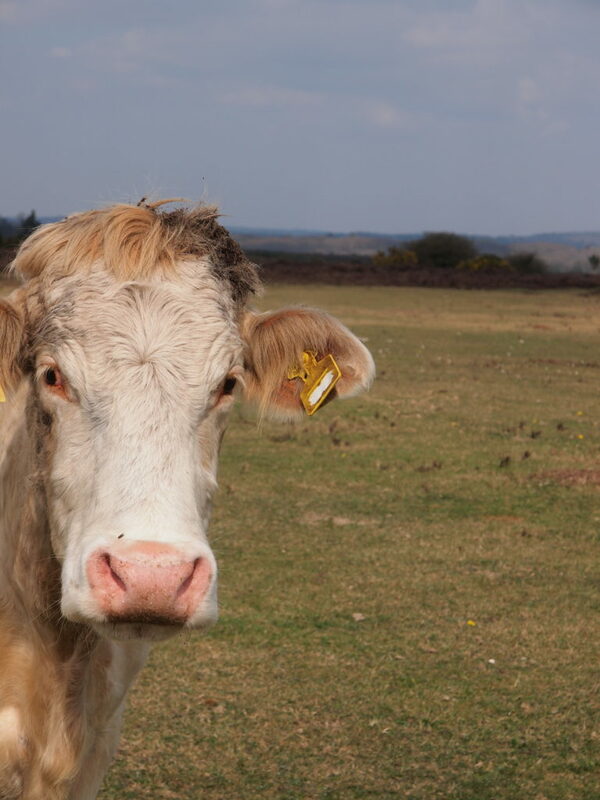 Any farmer who obtains BPS entitlements over the New Forest, can ask the agisters to mark their cattle for the New Forest, and claim over the Rural Payments Agency’s “eligible area”. The BPS is based solely on this area calculation, giving a fixed amount per hectare, shared amongst however many people claim according to the number of “Livestock Units” marked (A cow is one livestock unit). As a result the Verderers Marking Register increases each year, and the amount a commoner receives for each animal declines. In 2017 this bizarre system produced support of approximately £412 per marked cow and £247 per pony. 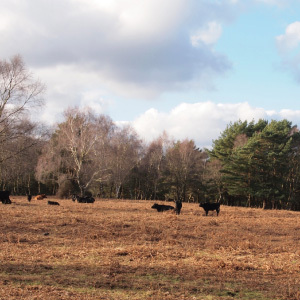 Additionally, the standard calculation of the “eligible area” is unstable in the context of the New Forest, where livestock graze a much wider variety of habitats than is normal on improved farmlands. This systems and its instability is neither desirable nor sustainable. 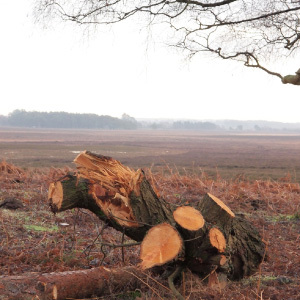 Support intended for the New Forest should work to the benefit of the New Forest. 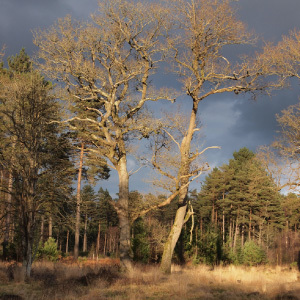 Since 2017 the CDA has been working with local partner organisations to press for change – towards a system that improves New Forest habitats, provides the necessary support to commoning, We would like to see a system that uses the current Verderers’ Higher Level Stewardship (HLS) Scheme as its starting point, support systems that are locally designed and managed, sympathetic to the New Forest. Most importantly, it must ensure that the common grazing of a mix of livestock remains sustainable within England most expensive National Park, with a challenging mix of high average costs and low average incomes in the local economy. Why should commoners’ get special housing treatment? In 1991 the Illingworth Report, which concluded a review of New Forest grazing for the Government, came to two important conclusions in response to widespread concern at the decline of the grazing upon which the special qualities of the New Forest depend. Firstly, it determined that sustaining the vocational commoning system was the only viable way to ensure that the New Forest continued to be grazed. Sustaining commoning, however, would depend upon ensuring the people willing to continue the system have access to homes and land. It called, therefore, for everything possible to be done to achieve this. This included the prioritisation of cottages managed by the Forestry Commission for commoning tenants, given the decline in commercial forestry needs, support for local charitable and social landlords. Since then the Commoners’ Dwelling Scheme has allowed families who already own some land to create new holdings on this land, under very strict conditions, and permanently tied to commoning. 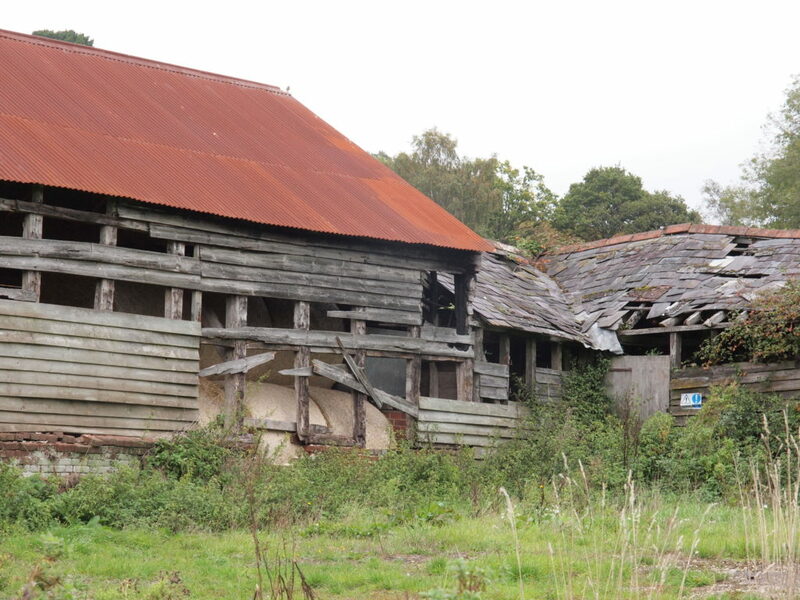 This scheme is only available to those who have sufficient land, who are willing to sign over their freehold on some of it forever, and can raise the funding to build a home and appropriate outbuildings. A quarter century after the Illingworth Report there has been much less success in developing commoners’ holdings for rent. 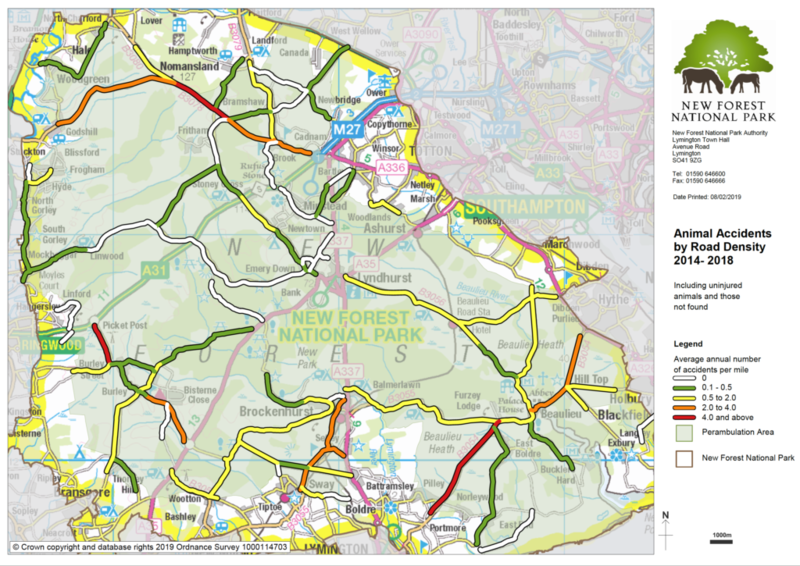 The New Forest has long been an expensive landscape, but this has accelerated since National Park status was imposed. Today the average property value within the National Park is more than 15 times the average local income. But to common on any scale working locally is imperative. A commoner must be able to step out of work at any time to deal with their livestock. Combining a local working life with keeping cattle and pigs is particularly challenging, meaning that the need to work locally and flexibly is imperative. Natural England require that cows form at least 25% of the livestock on the Crown Lands of the New Forest, as the mix of grazing animals is vital to the condition of the protected landscape and the exceptional biodiversity it supports. 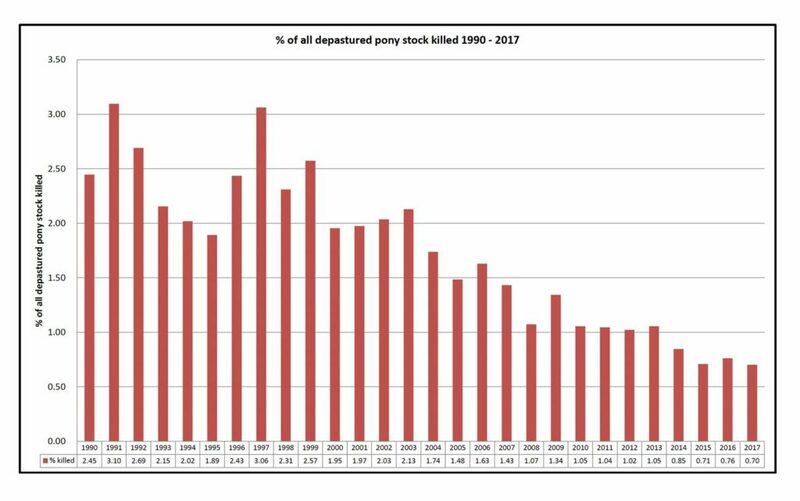 This could not be achieved if commoning was left to become the sole preserve of a wealthy local population using the common rights attached to their properties to turn out a small number of New Forest ponies. The Commoning Census carried out each decade shows that these people tend not to stay in commoning for very long; the hardships and commitment to maintain even hardy semi-feral ponies, with its cost, trials and tribulations, is certainly not for everyone. Sustaining the extensive grazing of the New Forest requires a large number of people, of all ages, scattered throughout the Forest, working and living locally, and with a lifelong commitment. This, in turn, requires appropriate small homes close to the grazing land, and sufficient facilities to keep a mix of Forest livestock. In the end everyone benefits from sustaining commoning. Maintaining access to a small number of homes and land for people willing to make the commitment required seems a very small price to pay for keeping the New Forest accessible, rich in nature, and maintaining its unique cultural heritage. Can I become a commoner? Yes. Anyone can be a New Forest commoner. Commoners come from all walks of life, and live all around the New Forest. Whilst the rights are linked to land and buildings, you only need to “occupy” the land to qualify. This can be shared, rented or owned, and of any size. It is, of course, important that you also have access to sufficient “back-up” land and facilities when you need it, so you can properly care for any animals that are allowed to graze the New Forest. There is a successful mentoring scheme, in which experienced commoners help young and new commoners learn how to do it well. Do commoners have to pay to graze animals on the Forest? Marking fees are payments made on each animal turned out onto the Forest for the present year. They are set by the Verderers and help towards the agisters’ (q.v.) salaries. No animal over 6 months age is allowed to be turned out on the Forest before the marking fee is paid and the animal marked by the agister. Are there commoners in other places? The use of ‘common’ land for grazing and other farming practices is widespread across the world. It also used to be widespread in the UK, with many areas of ‘manorial waste’ used to graze livestock, and collect fallen timber or other natural goods, as part of a peasant and smallholder based economy. The moves to enclose common land across much of lowland Britain started in the eighteenth and accelerated in the nineteenth century, when a series of enclosure acts deprived many small farmers of a large part of their income and forced them into the country’s growing industrial towns. Grazing on common land now survives in a number of restricted areas, mostly in the uplands of England, Wales and Scotland. Many of these areas are now designated as national parks and make up some of the country’s most precious landscapes. What is the origin of commoning in the New Forest? 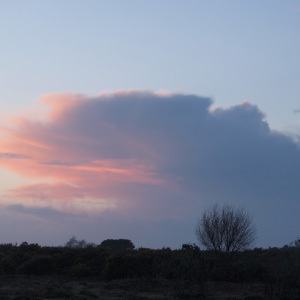 Following the Norman Conquest William the Conqueror designated the area we now call the New Forest as a Royal Hunting reserve (between 1066 and 1068). The designation resulted in the introduction of Forest Law which meant that the land couldn’t be enclosed for agriculture or housing – and introduced other controls that might interfere with the King’s hunting rights. In exchange for these controls, the Law established common rights to be exercised by those who owned or rented land within the hunting reserve. However, the right to graze animals on common land was widespread across the country at least until the end of Feudal times. Prior to the introduction of Forest Law, the New Forest, like many other areas of Britain was made up of large tracts of land whose common usage was an essential part of peasant farmers’ economy. From the 12th century onwards, increasing areas of land over which common rights were exercised were incorporated into the great estates of the nobility and church. Over succeeding centuries, the common agricultural land that had supported the lives of tenants and copyholders, was enclosed and converted to pasture at the whim of the landowner. In the 18th and 19th centuries, the enclosure of manorial waste and commons was accelerated under a series of Enclosure Acts, until very little land over which common rights operate now exists in lowland Britain. The New Forest was not seriously threatened by inclosure until, in 1851, an act of parliament (the Deer Removal Act) introduced a ‘rolling power of enclosure’ which threatened to turn all the best land in the Forest into timber enclosures and sell the remainder. As the full implications of the Act became apparent, local landowners whose rents were increased through the added income provided to smallholders by access to the common grazing, organized opposition through a petition to parliament in 1867. Shortly afterwards, this group founded the New Forest Association and set about preventing further inclosure. Using the growing interest in landscape, the Association galvanized the power of public opinion to save the Forest from inclosure and build the foundations for the 1877 New Forest Act which re-instated the powers of the Verderers and assured the future of the New Forest. During the latter part of the nineteenth century the urban populations around the New Forest spread considerably, while the development of the railway through the Forest and extension of the road network meant that new residents started to move into the villages in the Forest itself. Increasingly, commoners and their animals came into contact with people who had little understanding of their way of life, and often found the presence of their animals on roads and village greens a nuisance. In 1909 the New Forest Commoners Defence Association was founded in response to the increasing level of such conflict, and has continued to defend the rights of its members against numerous threats to the present day. Hammond, J L and Barbara (1920) The Village Labourer 1760 to 1832: A Study in the Government of England before the Reform Bill. Longmans, Green and Co, London. Pasmore, Anthony (1977) Verderers of the New Forest: A History of the New Forest 1877-1977. Pioneer Publications, Beaulieu. How do commoners know which animals are theirs? Commoners know their animals and can usually recognise them without difficulty. 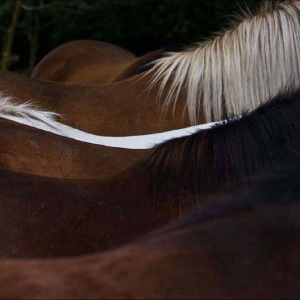 Each pony is branded with the owner’s brand and each cow or sheep carries identification tags in its ears. Donkeys have a brand or an ear button. The local agister is familiar with the animals in their area and can often identify most of them individually, too. What are the common rights of the New Forest? Common of turbary: the right to cut peat turves for the Commoner’s personal use – this right is no longer exercised. What are you doing to reduce animal accidents on the roads? The number of animal accidents has reduced dramatically since the Verderers’ records began. We cannot know for sure the reasons why this has happened, but have been working with the other Forest organisations to keep up efforts to reduce the number of accidents. 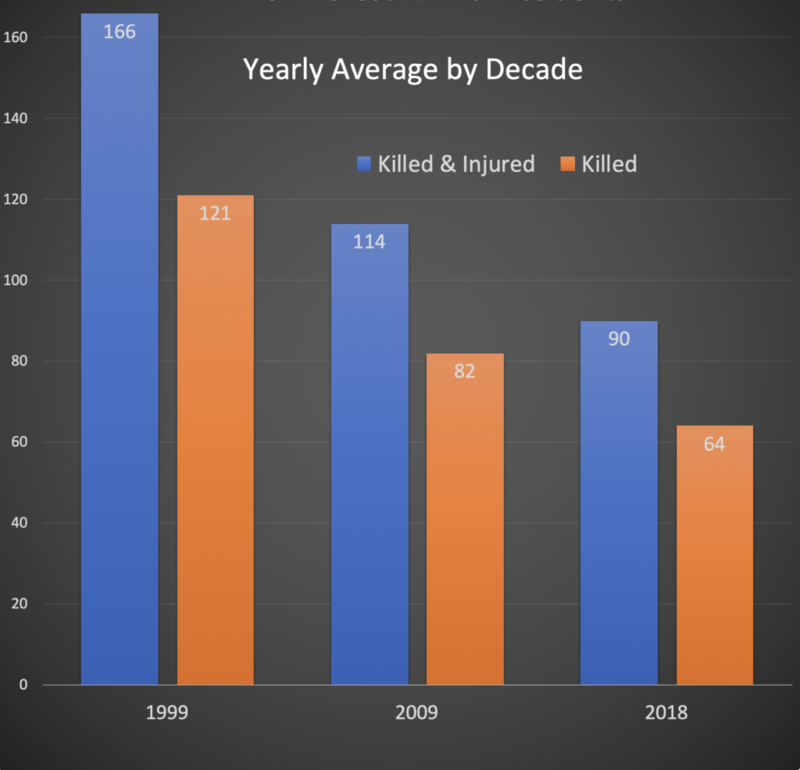 In fact the average number of animals killed each year has halved since the 1990s. 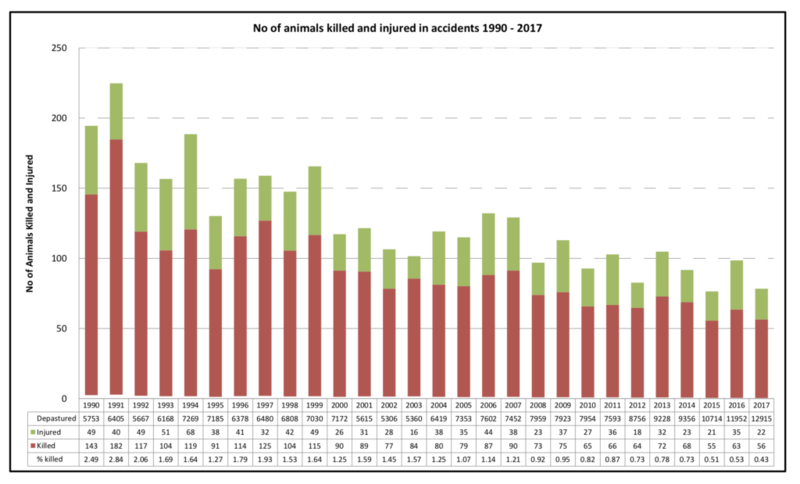 Despite the success in increasing the number of animals on the marking register to graze the New Forest, the proportion of those killed in accidents has fallen from 3% in some years in the 1990s to less than 1% today. Despite the real progress in reducing accidents it is important to understand that each one is a tragedy for the commoner concerned. Hit-and-run accidents are a particular concern due to the needless additional suffering caused. Failing to report an accident, leaving an animal in unnecessary suffering is an offence under the Animal Welfare Act. Failure to report any accident involving livestock is also an offence under the Road Traffic Act. The CDA and Verderers have funded a reward scheme for information that leads to the prosecution of drivers who hit and run, which we increased to £5000 in 2017. This is a measure of how seriously we take these incidents. The Verderers Higher Level Stewardship Scheme provides reflective collars suitable for ponies and donkeys free of charge, which helps to ensure that those successfully caught by their owners or on drifts are fitted with a collar, and lost or dirty ones replaced each year. Because they are designed to be safe if they catch on anything this does mean that they get lost, but the numbers with collars at any point in time is increasing. Evidence suggests that these do help, although they cannot be a complete solution. In the end the avoidance of accidents requires driving that is appropriate to the conditions, including the presence of livestock on roads, their unpredictable behaviour and the level of visibility. In 2018 an experiment began in the use of reflective ear tags in cattle and the Verderers Grazing Scheme provided funding in 2019 for these to be made available free-of-charge to commoners. Accidents peak around the evening commute and around the Autumn clock change, when more driving takes place in darkness. Our campaigns, therefore, concentrate on the Autumn, when we try to alert regular drivers to the higher risks they face. As everyone becomes oblivious to signs they see every day, we now have changing signage on the high risk routes and special signs for the winter. In 2018 Hampshire County Council made these winter signs reflective, following the first experiment in 2017. 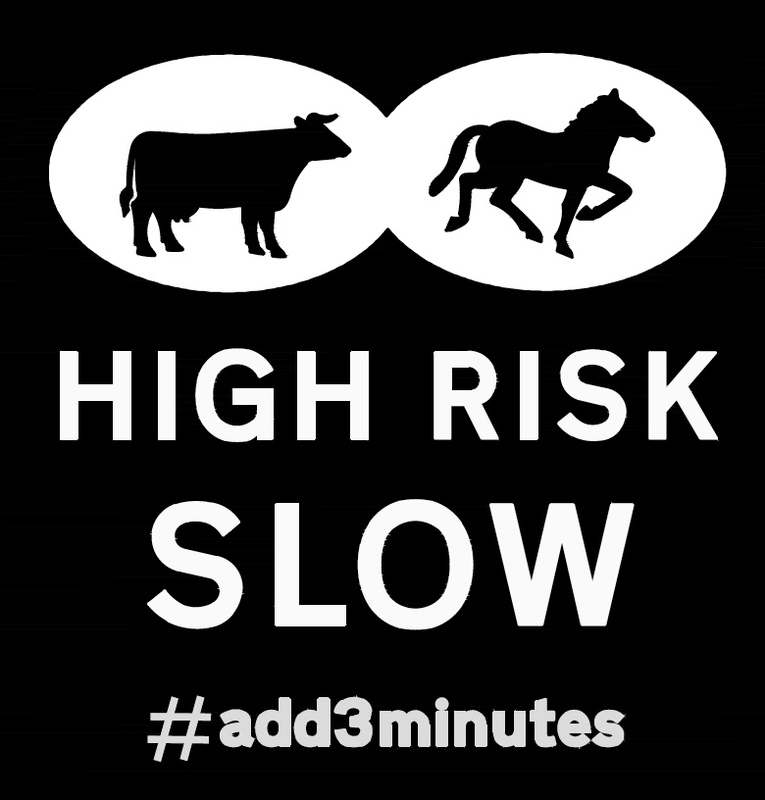 The biggest change is that all local agencies and organisations are now working around concerted campaigns and highlighting how little effort is involved in driving appropriately: The thinking behind the #Add3Minutes hashtag – the small amount of extra time added to a 7 mile journey across the Forest by driving at 30mph instead of the usual 40mph speed limit. Since 2011 the CDA has also been pushing for improved signage at access points, and in 2018 Hampshire has extended the use of the surface-painted “running pony” warning triangle to some of the main access points at the cattle grids. Hopefully the combination of the unusual signage and the rattle of the grid will remind drivers that they are entering a special landscape requiring special attention. There will always be people for whom enforcement is the only deterrent. We are pleased that the Verderers have been working with Hampshire police, giving financial support to the speed enforcement van, which now works in daylight and darkness. The CDA is also involved with work on the feasibility of the deployment of average speed cameras on one of the high risk routes, and are now hopeful that funding will become available to prioritise this initiative. Contrary to popular myth most accidents occur on the 40mph routes heavily used by commuters, where the roads are straight and sightlines are good across open countryside. This is shown by the map of accidents where the highest risk routes are shown in red and orange. Anyone familiar with reports of accidents will recall the most common spots for accidents, on straight roads where drivers are particularly confident in their safety. Commoners are very grateful to all those individuals and organisations who are working with us, and welcome new ideas for ways of helping people drive with special care in the New Forest, where grazing animals have right of way on the roads, and whose constant and widespread grazing is essential to keeping the New Forest so special and loved by millions. More data on animal accidents are available on the National Park Authority website – A couple are reproduced here. We also have a leaflet offering practical advice to New Forest drivers. I’ve seen a dog chasing a pony. What should I do? Call the Police. Please note as much information as possible on the dog, its owner and any vehicle, and the animal being chased. Worrying livestock on grazing land is a criminal offence under the Dogs (Protection of Livestock) Act 1953. Worrying includes chasing or attacking an animal, whether it is a sheep, cow or pony. The court can order for the dog to be destroyed, for the dog to be muzzled or kept on a lead, and for the owner to be fine and forced to pay compensation to the livestock owner. Since 2014 it has is been a criminal offence for a dog to be “out of control” in a public place under the amended Dangerous Dogs Act 1991. They can be prosecuted not only if the dog actually injures someone or makes them worried about being injured, but also if it attacks someone’s animal or makes the owner worried about the risks of trying to stop an attack on their own animal. In the New Forest we also benefit from specific byelaws under which dog owners can be prosecuted. On the Crown Lands managed by the Forestry Commission the byelaws make it an offence for any dog to be out of control, giving its staff the power to demand that a dog is put on a lead. The National Trust byelaws prohibit any dog that is not under “proper control” and annoying or disturbing any person or animal. Why don’t all animals have reflective collars? Collars help significantly with keeping commoners’ animals safe on New Forest road, and are probably one of the reasons for the improvement in the rate of accidents over the past two decades. Collars have been designed to be safe for ponies, so they can’t get strangled by them, but the elastic content means that they are quite easily removed. The owners will do their best to replace them when they can, but often this can only be done when they are rounded-up and in the Autumn, which also depends upon them being caught by a round-up. Collars cannot be safely fitted to foals, and we’ve not found one that is effective for cows, sheep or pigs. In 2018 commoners did start experimenting with reflective ear tags for cattle. It is important to remember that collars do not show up from all directions, and are not an alternative to taking very special care on New Forest roads. The animals have right of way on New Forest roads, and it is important that they use them to move between grazing areas. Do the RSPCA or other welfare organisations inspect the animals? There are two welfare tours each year arranged by the Verderers. They are attended by DEFRA, British Horse Society, International League for the Protection of Horses, Blue Cross, RSPCA, Donkey Sanctuary, and local veterinary surgeons. The results of the survey are reported in the minutes of the Verderers’ Court. The welfare organisations also carry out their own independent inspections. Would it make sense to fence the roads? Fencing the roads would quite literally destroy the New Forest, as it would rapidly lose the special qualities that led to it being made a National Park. A fenced New Forest would be little different from the rest of Hampshire. Only the largest fenced sections could be grazed by a mix of livestock, and the remainder would revert to dense scrub. Fenced roads would become faster, and more hostile for walkers, riders, and cyclists. It may be that some areas could be mown in order to maintain some gated paths and open space for public enjoyment, but the cost involved would be very high indeed and mowing would not retain the very rare species of flowers, animals, and fungi supported by traditional grazing practice. How tame are the animals? All the animals are managed, but most of them are not ‘tame’, since they live much of their lives on the Forest and are only handled when necessary. They are normally described as ‘semi-feral’, being neither wild nor tame. However, some animals have been handled more than others: ponies may be retired riding ponies, or been taken off the Forest and handled for showing. Some owners halter break their foals to make it easier to handle them when future need arises, while others are almost entirely unhandled. The cattle have to undergo regular TB tests. New Forest commoners have agreed to a more stringent testing regime than in other parts of the UK in order to protect the New Forest herd and they are often taken off the Forest or given supplementary feed over the winter, since there is little food for them and the hard winter months make it difficult for them to stay healthy. Most of the ponies remain out over the winter, unless their condition drops and they have to be brought in for some TLC. Some owners do remove their ponies during the winter, though, because of the increased risk of road accidents. Also some cattle owners remove their cattle from the Forest during the Autumn to reduce the risk of acorn poisoning. What happens when an animal dies? Whether a commoner’s animal dies naturally or in an accident the New Forest relies on the local hunt to collect and dispose of the remains so they are not left on the Forest. Thankfully the New Forest Hounds do this quickly and efficiently. The huntsman is certainly one of the many unsung heroes of the New Forest, as this is an important but rather thankless task. The Verderers Higher Level Stewardship Scheme has supported the hunt to meet the rising costs of incineration, so the system meets the latest environmental standards. Can I feed the ponies and donkeys? No. This is harmful for the animals. It is vital that they learn to look after themselves throughout the year. Feeding encourages to stop natural grazing and hang around in the hope of hand-fed food. They end up losing weight and unable to cope with the winter. Associating humans with food also draws them towards the roads, and can make them dangerous around people as they compete for handouts. Some items, like carrots, also present a real threat to their health. They can easily choke on hard items, or get colic from a rush of things like apples or grass clippings. Colic is often fatal. Their natural grazing is also vital to the New Forest, making it great for nature and public access. They really must not be diverted from their constant grazing. Shouldn’t the New Forest be rewilded? The landscape of the New Forest is one of the few places where traditional, pastoral land management has survived. Because of this it still supports numerous rare species that were once common across the UK. The environmental success of the area is achieved by striking a careful balance between maintaining its wild character and sensitive land management, including rotational cutting and burning and, of course, constant grazing by herbivores. Places are reported to have ‘rewilded” have, in fact, adopted systems of grazing and land management similar to those long practiced in the New Forest. Is the New Forest overgrazed? Many people falsely interpret the Verderers’ Marking Register as a record of the number of animals actually grazing the Forest. The reality is much more complex, as many of these animals may only briefly, occasionally, or never be turned out to graze. The Common Agricultural Policy (CAP) Basic Payments Scheme (BPS), for example, requires farmers to present the marking fee receipt in order to qualify for basic payment on the animal. It would not make sense to require that these are turned out. It is more important that commoners, the Verderers, and Natural England assess conditions on a local, case by case basis with the welfare of the livestock and the biodiversity of the New Forest uppermost in their decisions. 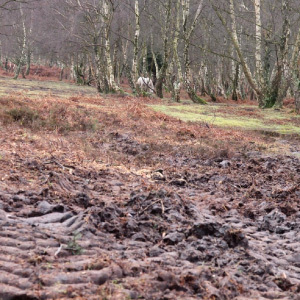 It is unfortunate that the Common Agricultural Policy works in a way that causes this confusion, and the Commoners Defence Association has been working closely with the other major New Forest organisations to lobby for a future support system that is better suited to the unique circumstances of the New Forest. The Basic Payment Scheme has given an important boost to commoning, which was in a very poor state previously, enabling commoners to invest in their holdings, the welfare of their herds, and to achieve the increase in cattle numbers required by Natural England. Despite BPS support, however, commoners must still subsidise their commitment to Forest grazing with income from their “day” jobs, and with their time. Commoners have a very strong interest in protecting the New Forest. Indeed, we are usually the first to act when damage is done to the habitats that our animals graze. The grass, shrubs, hedges, water sources and trees are all vital to the welfare of our livestock. As commoners we must judge grazing levels by the condition of our livestock, sustained by what the New Forest provides, and the condition of the habitats supported by grazing. Twice a year the Verderers run a welfare tour, taking national and local organisations with an interest in welfare to random sites to inspect the livestock. Commoners have an individual responsibility for the condition of their animals, and will take them home should they lose condition with no early prospect of improvement. Natural England have responsibility for the condition of the habitats, which are broken down into individual SSSI units. 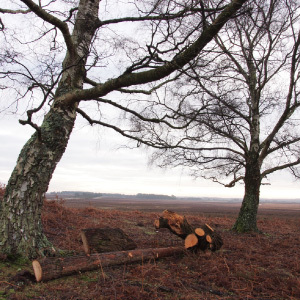 Natural England assesses that of the 29,000 hectares in the New Forest SSSI just 1.14% are unfavourable and declining. The majority of the 582 SSSI units are in favourable condition some 97% either favourable or unfavourable and recovering. Anyone who takes a moment to study the Natural England assessments will soon discover common reasons amongst those few SSSI units in declining condition, particularly undergrazing, human interference with watercourses, campsite and other human pressures. The most recent assessments also show the benefits of some of the work that has been done under our current agri-environment scheme (known as Pillar II of the Common Agricultural Policy). The Verderers Higher Level Stewardship Scheme (HLS) for 2010-2020 and its predecessor schemes have played a significant part in this exceptional achievement. 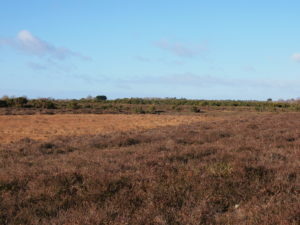 The current Verderers HLS Agreement also includes specific conditions for each habitat type, for example ensuring that there is sufficient soil poaching by cattle to sustain some of the rare breads that survive in the New Forest, of which the small fleabane is the most cited example given that it has declined catastrophically from being widespread across Britain to near extinction other than its New Forest strongholds. The HLS required the partners to ensure that the proportion of cattle in the Forest’s stock was increased in order to maximise the biodiversity potential from grazing. The New Forest pony too is now a rare breed and it is vital that pony numbers are kept at levels that provide sufficient foals to maintain disappearing bloodlines. How are commoners represented in the Verderers Court? Anyone, commoner or not, can make a “presentment” to the regular meetings of the Verderers Court on any Forest matter than concerns them. The commoners also elect their five members of the Verderers Court, to represent them within this important decision making body, and sit alongside the four appointed verderers, and the Official Verderer. The Official Verderer is usually also a commoner. The Verderers’ website provides useful information on the Court and the work of the Verderers.